If the octopus is not previously frozen, beat it with a meat mallet o place o into the freezer for a couple of hours to soften the fibers. 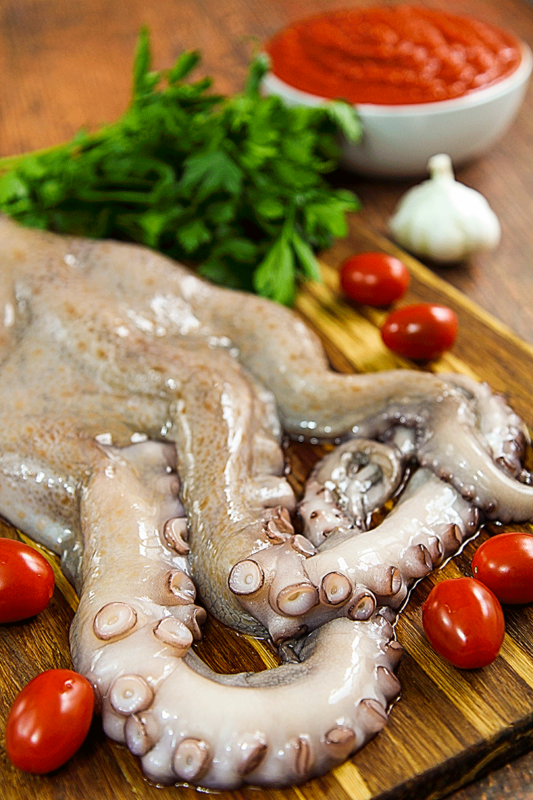 To clean the octopus, cut and discard the eyes and the beak, pass it under running water and dry with paper towels. Wash the salted capers under running water then mince them coarsely (will be used instead of salt throughout the recipe). Now, wash and cut the cherry tomatoes in half, then peel and crush the cloves of garlic discarding the bud inside them. 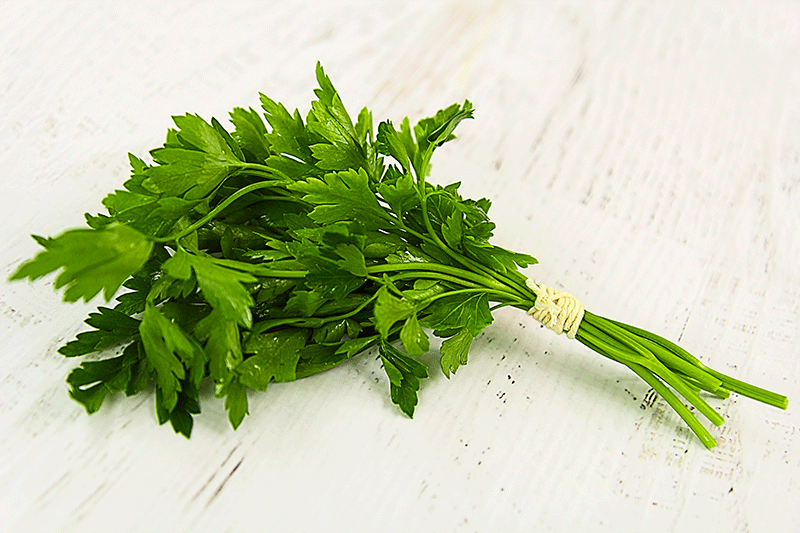 Finally, wash the parsley and form a bunch tied with kitchen string. In a at least 5 quarter pot, sauté the garlic and the chili pepper in olive oil. When the garlic is golden, and leave it from the pot and conserve aside, then add the octopus and cook for a few minutes. Now, add the white wine and continue cooking on high heat to evaporate the alcohol. 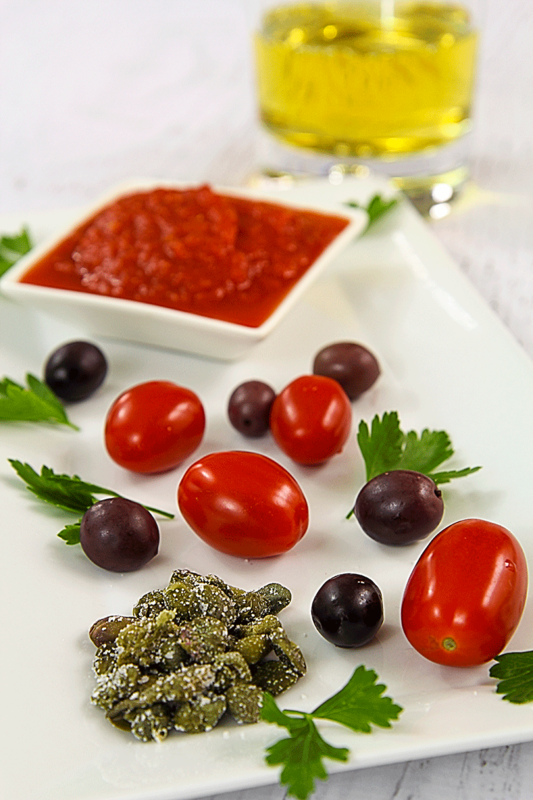 When the alcohol has evaporated, add the cherry tomatoes, the tomato pulp, the bunch of parsley tied, the chopped capers, the olives and the garlic previously sauteed. Mix the ingredients then set the heat to low and close the pot as described in the next section! 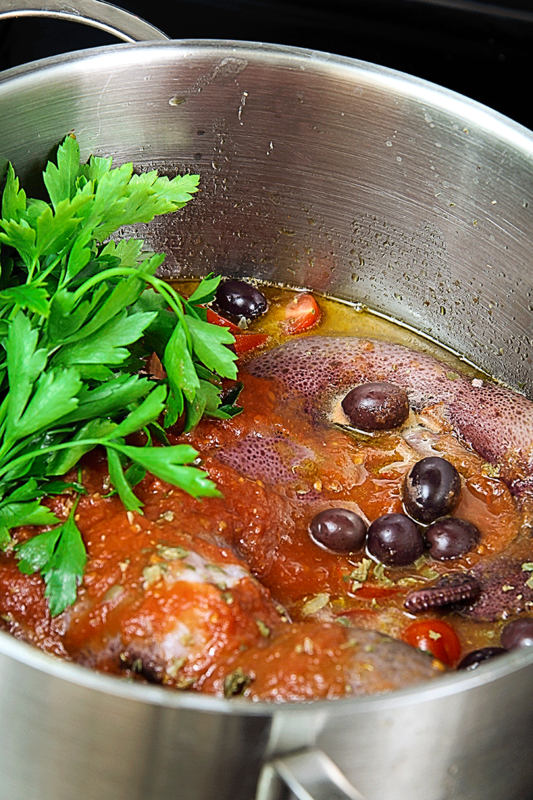 Originally the Luciani fishermen use to cook the octopus in pots covered and wrapped in a wet cloth. 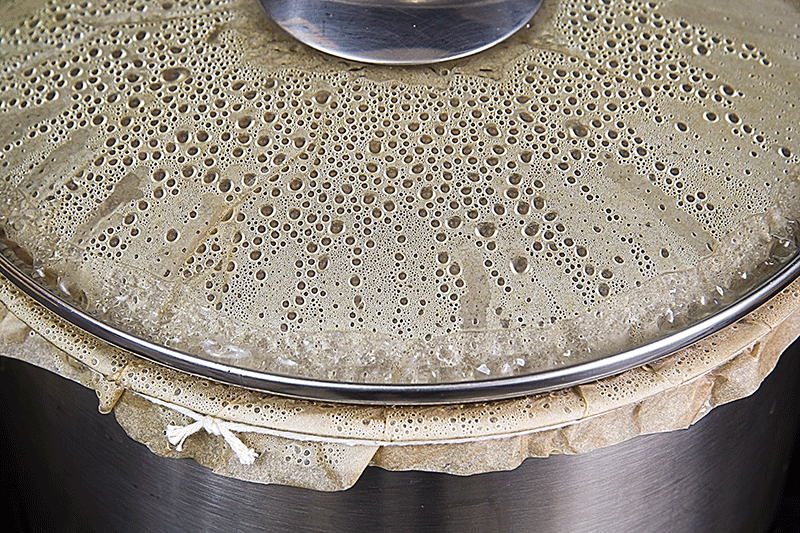 – Cut a sheet of parchment paper a bit ‘bigger than the pot and dampen slightly. – Lay the sheet on the pot to cover it and tie with kitchen twine as shown in the photo below. – Cut the excess paper and twine in order not to burn them with fire stove. 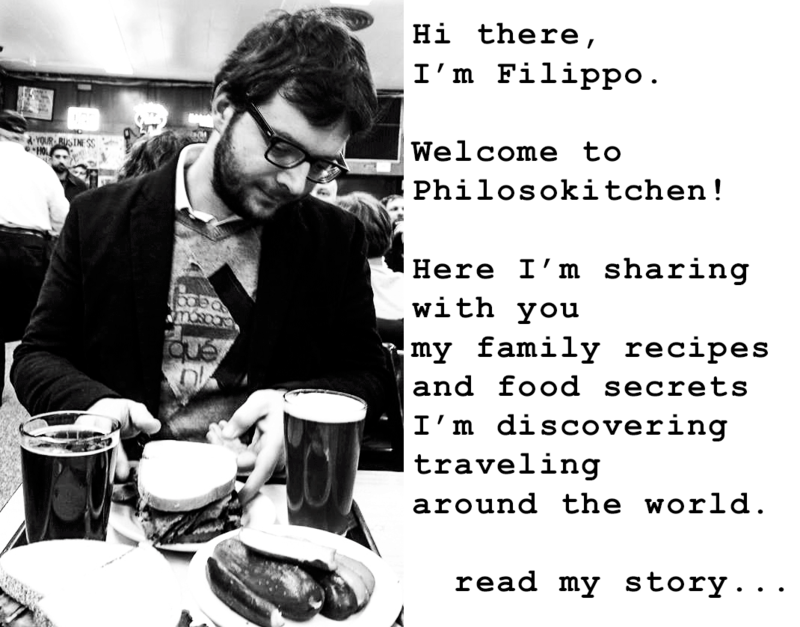 – Cover the pan with a lid with no orifices. With every passing minute the sheet of parchment paper will swell slightly under the cover. Always keep the heat to low and not raise the lid until the end of cooking. For cooking times calculated 25 minutes for each pound of octopus. Past the cooking time, remove the sheet of parchment paper carefully so as not to burn yourself with the steam. 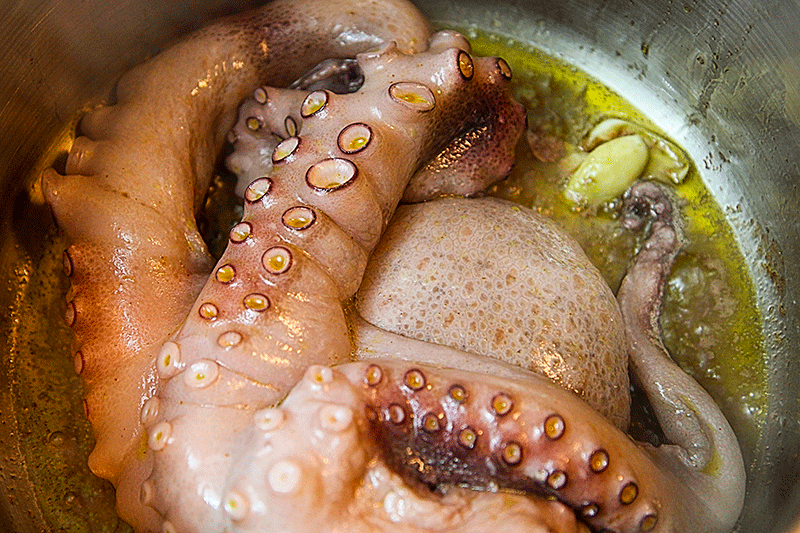 Remove the octopus from the cooking liquid and lay it on a cutting board. Meanwhile, discard the bunch of parsley and reduce the cooking liquid over medium heat until it has reduced by about half. 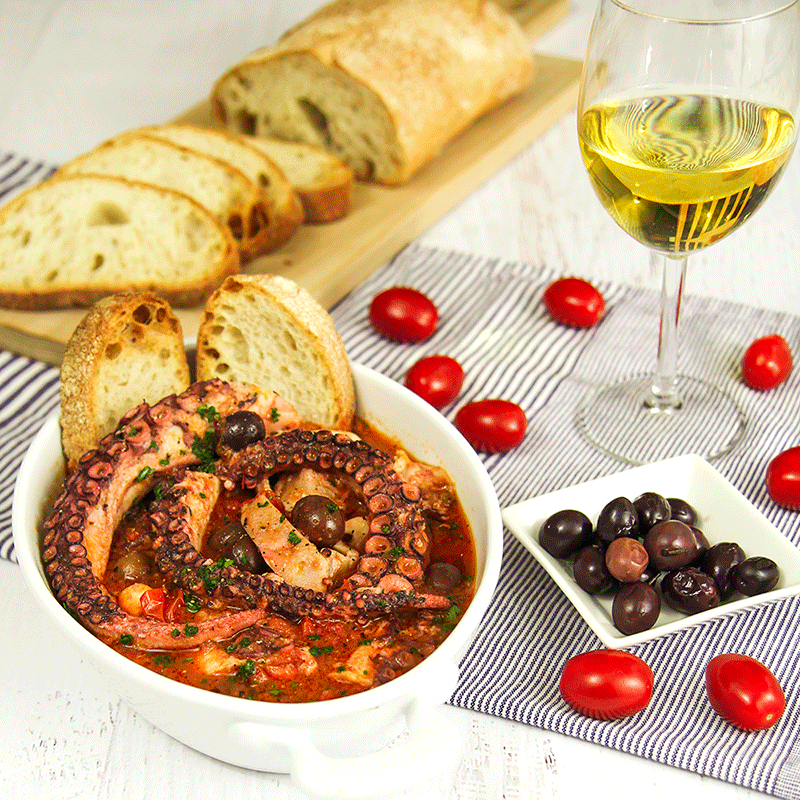 When the octopus has reached a temperature “manageable” cut the tentacles and eliminate the skin with your fingers keeping the suction cups (if cooking has been corrected, the skin will come off easily). Discard the skin of the head as well and cut the head into rounds. Palce all pieces of the octopus in a serving dish with the sauce reduced. Sprinkle the dish with a handful of fresh minced parsley and serve hot, but not too much with croutons and a glass of good white wine! - Cut a sheet of parchment paper a bit 'bigger than the pot and dampen slightly. - Lay the sheet on the pot to cover it and tie with kitchen twine as shown in the photo below. - Cut the excess paper and twine in order not to burn them with fire stove. - Cover the pan with a lid with no orifices. Past the cooking time, remove the sheet of parchment paper carefully so as not to burn yourself with the steam. 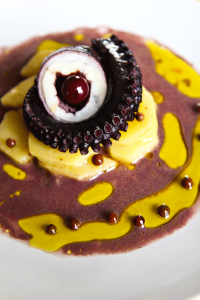 Remove the octopus from the cooking liquid and lay it on a cutting board. Meanwhile, discard the bunch of parsley and reduce the cooking liquid over medium heat until it has reduced by about half. 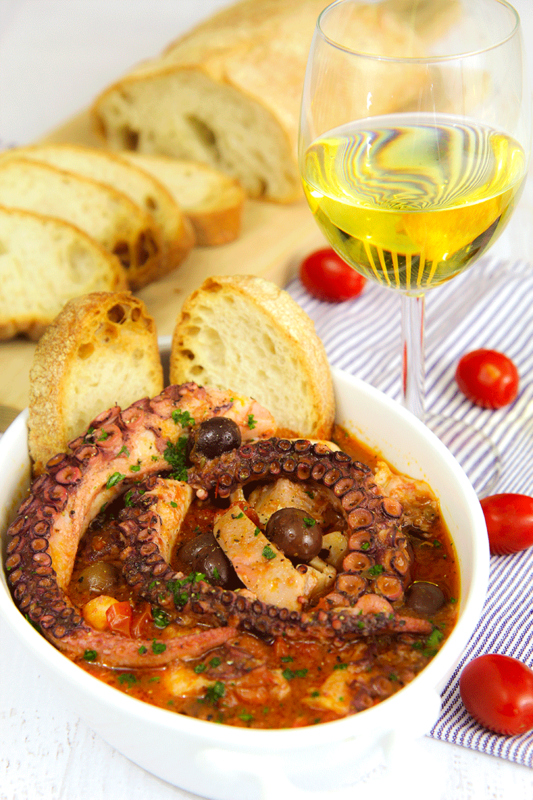 When the octopus has reached a temperature "manageable" cut the tentacles and eliminate the skin with your fingers keeping the suction cups (if cooking has been corrected, the skin will come off easily). Discard the skin of the head as well and cut the head into rounds. Palce all pieces of the octopus in a serving dish with the sauce reduced. Sprinkle the dish with a handful of fresh minced parsley and serve hot, but not too much with croutons and a glass of good white wine!